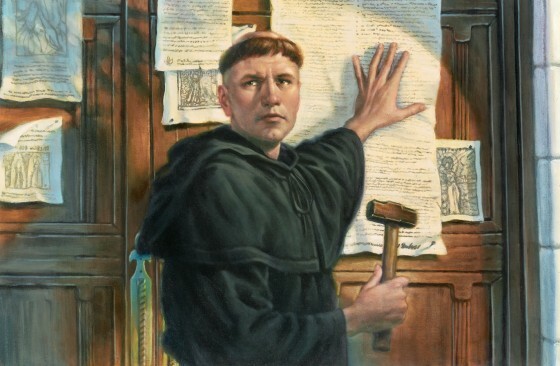 On this day in 1517, the Augustinian monk Martin Luther nailed his 95 theses to the door of the Castle Church in Wittenberg, Germany. The theses that Luther penned and posted that day set in motion events that reverberate into our own time. It is not an overstatement to say that Martin Luther has been among the most influencial historical figures of the last 500 years. There was a time when throughout the western world the Bible was the only book read more widely than Luther’s writings. Think about that. Luther used the door of the Wittenberg church to post his theses along with an invitation to debate because it was a well-known community bulletin board. Wittenberg was also full of pilgrims that day who were gathering for the All Saints Day observances and a monk posting a notice would have been unremarkable. As he came and went it is likely that he went largely unnoticed. Unfortunately, unnoticed can also describe Luther in our time. The year was 1988. I had just arrived at a Lutheran congregation here in California to begin my work as associate pastor for youth and parish education. On the first day of 7th grade confirmation class I distributed a brief, one page set of questions to the kids in order to get a sense of their knowledge of the Bible and their Lutheran faith. One of the questions was, ‘Who was Martin Luther?’ Well over half the class identified Martin Luther as a black man who was killed or had something to do with civil rights. A number of the kids answered that they did not know. Of that group of over twenty kids, three were able to identify Luther as the reformer. At about the same time I was asked to address a Sunday morning adult class of over 50 people on the subject of Luther. To begin I described the theology of the cross and the theology of glory and asked the group for a show of hands regarding which they thought represented Martin Luther’s theology. Nearly every person went with the theology of glory. Wrong. No wonder the kids were clueless. I went home that morning in a blue funk. Not because I was surprised but precisely because after having already served three congregations in two other states, I had come to expect this. Now, I am all for dusting off the 16th century once in a while and re-visiting the events of Luther’s life and time. It is important to do so. At the same time, I am more concerned that people today who inhabit the corridors of Lutheran churches, or any church for that matter, have some inkling as to why Luther matters. Because he does. And he matters not because Martin Luther got everything right but because he points us to what is essential, he points us to the Cross, to Christ where our true salvation is found. Luther read his Bible and there discovered that we have no right or need to say anything or do anything for our salvation. As far as God is concerned, we have nothing to offer. Rather, as beggars in the bread line we can do no other than hold out our empty hands and receive the salvation that God gives on His terms, by grace alone, in the crucified and risen Jesus.